The Science Behind the Roof Shampoo® Roof Cleaning Method. The NON-bleach, ECO-FRIENDLY Roof Shampoo® roof cleaning soap is specially formulated and buffered to be used with a wide degree of safety. It is proven to be safe on landscaping around the home, yet highly effective at removing algae and other roof staining organisms from shingles. Household plants have an exterior membrane called a cuticle that protects the plant from many substances, including Roof Shampoo®. Algae, however, doesn’t have a cuticle. It can be unicellular or form filaments, nets, sheets, spheres, or complex moss-like structures. So the Roof Shampoo® product attacks the algae and cleans it off the shingles while NOT harming other vegetation around the home! Some roof cleaning contractors, however, use caustic chlorine bleach which is a powerful oxidizing agent capable of breaking up most protein structures, including the plant cuticles of the vegetation in the landscaping surrounding most homes. Think of the time you accidentally poured too much bleach on a laundry item…it was bleached white where the concentrated bleach hit it right? The whitening comes from the bleach oxidizing the fabric’s pigments and dyes. Now if you pour 12.5% bleach on your jeans for example, it will whiten them and then the cotton fibers will completely fall apart. The cotton fibers have been oxidized, in this case that literally means cut into smaller fragments. Your jeans will look like Swiss cheese. Often times roof cleaners who use bleach will use it in concentrations as high as 40% - 50%. Now imagine what that will do to your landscaping. Click here to read more about the different roof cleaning methods and the dangers of bleach. 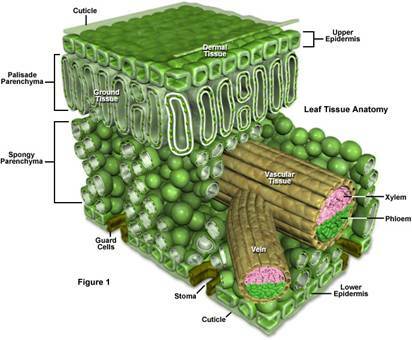 Pictured below is a diagram of the cellular structure of a typical household plant found in landscaping around most homes. This diagram depicts the exterior membrane (cuticle) that is capable of being penetrated and destroyed by the 'bleach roof cleaning method'. Roof Shampoo® on the other hand will not, in fact cannot penetrate this cuticle which is why it will NOT harm landscaping. Unlike household plants, roof algae doesn't have a cuticle which is why the Roof Shampoo® product easily and completely cleans these organisms off the shingles while leaving your landscaping unharmed and intact. SOFT PRESSURE, NO PRESSURE, LOW PRESSURE? The Roof Shampoo® Sprinkler-Disc rinse system uses a very gentle, low pressure water rinse to completely clean the roof. This proprietary Roof Shampoo® rinsing system, along with our Roof Shampoo® eco-friendly stain removing products, ensures that we clean ALL the algae, lichens or moss under the edge of every shingle. Our process does not leave behind any staining, nor does it damage the shingles like a high pressure rinse would. A spray on leave on product, or a system that claims to use no pressure does not use an efficient rinse system and just cannot COMPLETELY remove the algae, etc. Why Have My Roof Cleaned?